Reel Talk Online: It's Beginning to Look a Lot Like Christmas! 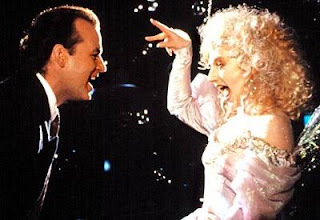 Scrooged (1988): I love everything about this film from start to finish. It's a remake of the Charles Dickens classic the only way Bill Murray knows how--hilarious, raunchy, cynical, and of course wildly entertaining. How the Grinch Stole Christmas (1967): Yes, the original one (though the Jim Carrey version is good too). This little green monster is devilish, slick and a serious klepto in this classic about a green menace that wants nothing more than to ruin the Christmas of all the young'uns in Whoville. Gremlins (1984): Trust me, this is a Christmas movie, just a little different from your average sweet festive cinema. Gremlins celebrates the holidays with tons of aesthetically-challenged creatures who are multiplying by the minute. Just don't feed them after midnight. National Lampoon's Christmas Vacation (1989): Christmas gets Griswold in this hysterical flick about the famous family with the worst luck ever. Luckily for us, it provides for some awesome laughs. Who can forget the classic dinner table scene which ended with the Christmas tree catching on fire and burning to a crisp? I know I can't. Home Alone (1990): Remember cute little Macaulay Culkin? He was adorable in this role as the mischievous youngster who gave a couple of pesky robbers a piece of his mind, and left them bruised, battered and bewildered all just before Christmas day. What's your favorite Christmas flick? Just the blog post to get one in the mood for a good Christmas flick! I personally loved Scrooged, but my all time favorite Christmas movie is..now don't laugh....The Muppet Christmas Carol. It had amazing music that really told a story. Great dialogue, and the characters were played so authenticaly that, after a while, you actually see past the muppets...odd as that sounds. Thanks for reminding me why I love holiday flicks! Great Christmas list Candice! Nice way to think of our favourite movies at this time of year.